Heat oven to 400 degrees. Slice spaghetti squash in half lengthwise and scrape out seeds. Rub ½ tablespoon olive oil onto each cut side of squash and season with salt and pepper. Place cut side down on a large baking sheet and cook for 45 to 60 minutes, until tender all the way through. Heat 1 tablespoon olive oil in a large nonstick skillet over medium heat. Add onion and cook until tender. Add turkey and garlic and cook until turkey is cooked through. Season turkey with Italian seasoning. Add tomato paste and crushed tomatoes and stir well to combine everything. Reduce heat and simmer 5-10 minutes. Add red pepper flakes and more salt and pepper if necessary. 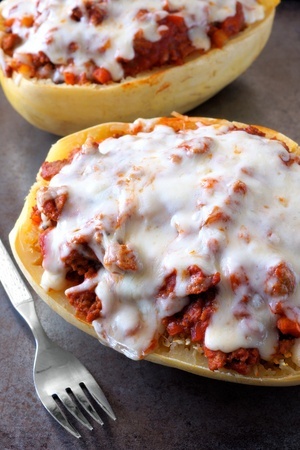 Scrape out inside of spaghetti squash with a fork into bowl. Serve topped with meat sauce and melted Gordo’s Cheese Dip.